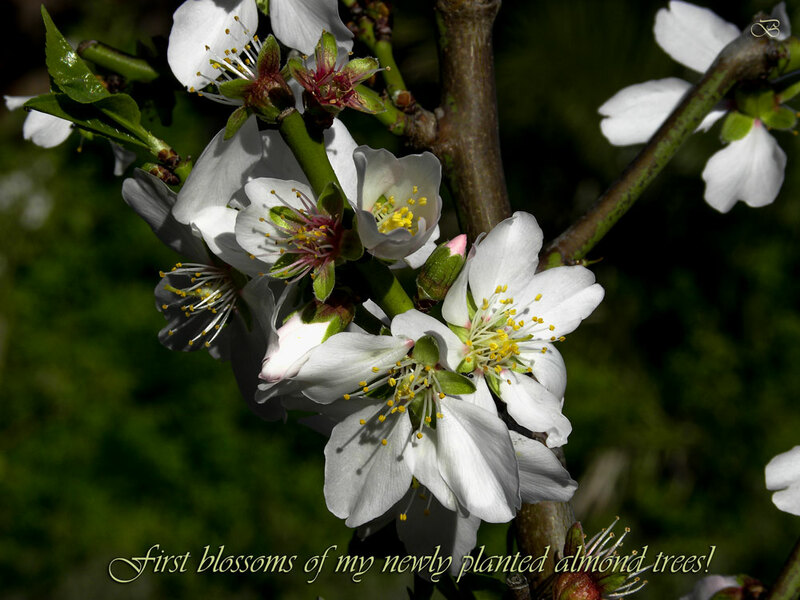 Finally, spring has come to Noordhoek, South Africa, and here is a digital photo of my flowering almond trees that I planted this winter! The white flower buds on this deciduous tree open before the leaves appear, normally as of two years – that’s the stage my trees are in. Aren’t they just too gorgeous? What a gift after all those thunderstorms, hail, snow in the mountains, debilitatingly cold temperatures (we are spoilt, yeah!) and torrential rains! Many flower seeds I had already put out in the ground just got swamped away – and now this! Fertility is reached at about four years – about 2 years from now – and the highest yield of fruit (containing the edible seeds called almonds) can be expected at seven to nine years. The nuts take half a year to develop after the blossoming stage, and, as we have many squirrels and birds in the garden, the question will be ‘who’s first’? Although almond trees are hermaphrodite, down here we have to plant two different sorts of almond trees for pollination purposes. As our trees are within a large lavender field, there will be no shortage of bees, ever! With seeds and nuts, fruit and veggies being the essential parts of my daily meals, I am looking forward to getting the almonds from my own garden. I will follow the developments in the lavender field closely – and with my camera in hand! Can’t wait for the fruit to grow. Once all the outer shells are open, the seeds can be harvested – so exciting! Spring in Noordhoek is really my favourite time of the year! Besides, it makes the ‘Law of Opposites’ so clear: we would never appreciate light if we didn’t know darkness… or joy without sadness… nor success without failure! With this in mind I wish everyone a fabulous week ahead! 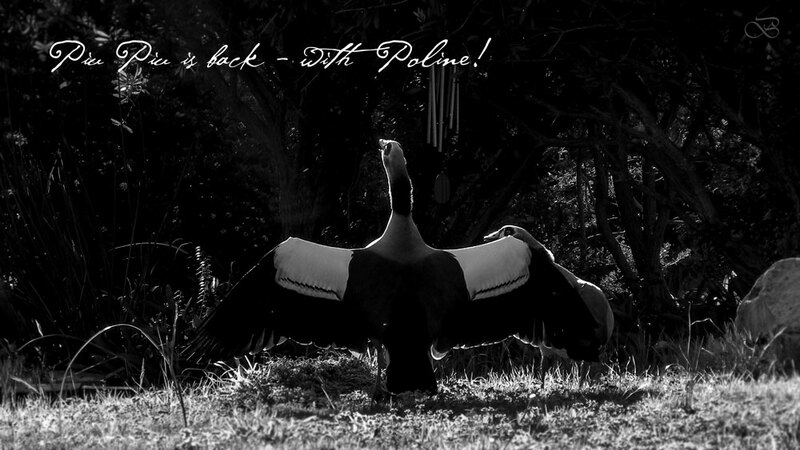 Incredible, but true, our wild Egyptian goose, Piu Piu, is back! And even more exciting: he brought his mate, Poline! If you followed how the story of Piu Piu started HERE and – apparently – ended HERE, and if you’re an animal lover – and you wouldn’t be reading this if you weren’t! – then you can feel the joy! It’s just too beautiful for words! The amazing thing about ‘Piu Piu of Noordhoek’ is that he not only came to visit us, but also the family who originally found the little abandoned chick! Now how cool is that? Stay tuned as this new story evolves… while the book on the Life of Piu Piu (adventure fiction) – is already going through the pre-publishing channel.